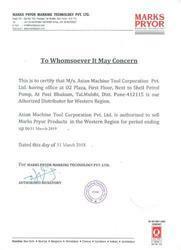 Being a leading name in the national market, Asian Machine Tool Corporation Pvt. Ltd. was engrossed in offering a wide collection of Marking Machines to our customers. From the day of our establishment in the year 2012, our firm has been betrothed in the domain of offering these to our customers which are widely recommended and cherished for their ruggedness, high strength, and fine finish. The material used in their development is of top notch quality and is examined properly to retain its superiority at the end of our customers. Owing to their availability with us in a number of sizes and dimensional provisions has earned us massive appreciation and credibility in this arena. Since our inception in this industry, we are focused towards fulfilling the changed desires of our customers by working under the management of Mr. Chiranjiv Pinjari. His customer-focused approach and ability to understand our clients’ needs make him a preferred business name. Additionally, it is under guidance that we aim towards becoming one of the leading business names. To become one of the preferred business names, we are readily focused towards understanding and furnish the changing needs of our customers in the best possible manner. Right from our superior quality products to the defect-free delivery, customized solutions, affordable rates, flexible mode of payment and reasonable pricing structure, we are readily successful in becoming one of the notable business names. Retaining quality in our presented range of products is our prime motive since we have incepted our base in this highly competitive industry. Making use of top notch basic material in the production process, we assure of retaining top quality standards of our offered products. Also, our products undergo a strict series of quality tests to ship a defect free consignment of products at the end of our customers. More to this, our customization facility and tamper-proof packaging for this range has assisted us in delivering a safe and defect free consignment at the end of our customers. Our trading Brand is Pryor. We have an extensive Marketing and Customer Support Network in central, western & south India to cater to customer needs. There are two Regional Offices in metros across India. There are additional Sales and Service Centers in major industrial towns to provide effective and timely Customer Service.